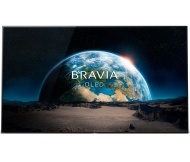 alaTest has collected and analyzed 310 reviews of Sony Bravia KD-65A1 Series. The average rating for this product is 4.7/5, compared to an average rating of 4.3/5 for other products in the same category for all reviews. Views about the color and design are on the whole positive. The usability and sound are also appreciated. Many are critical about the remote control and price. Opinions about the reliability and size are different. We analyzed user and expert ratings, product age and more factors. Compared to other products in the same category the Sony Bravia KD-65A1 Series is awarded an overall alaScore™ of 98/100 = Excellent quality. Pay the Sony premium, and you'll be rewarded with one of the most remarkable TVs ever made. Sony once again shows the rest of the TV world how it's done. Sony's OLED TV costs a lot more than its LG rivals, but does its picture quality justify the price? We compare the two best TVs ever side-by-side. With an amazing picture that matches but doesn't exceed LG's 2017 OLED TVs, the Sony XBR-A1E isn't worth the premium for most high-end shoppers. Take an OLED panel and combine it with Sony's picture processing wizardry and you get what is the best image we've seen on an OLED TV. But how HDR will affect OLED lifespan we don't yet know.